If you've checked out my Race Results page lately, you'd see that I...uh....get around...the adventure racing scene. In the past 12 months I've raced with at least 4 distinct teams, even with a few variations on those teams here and there. 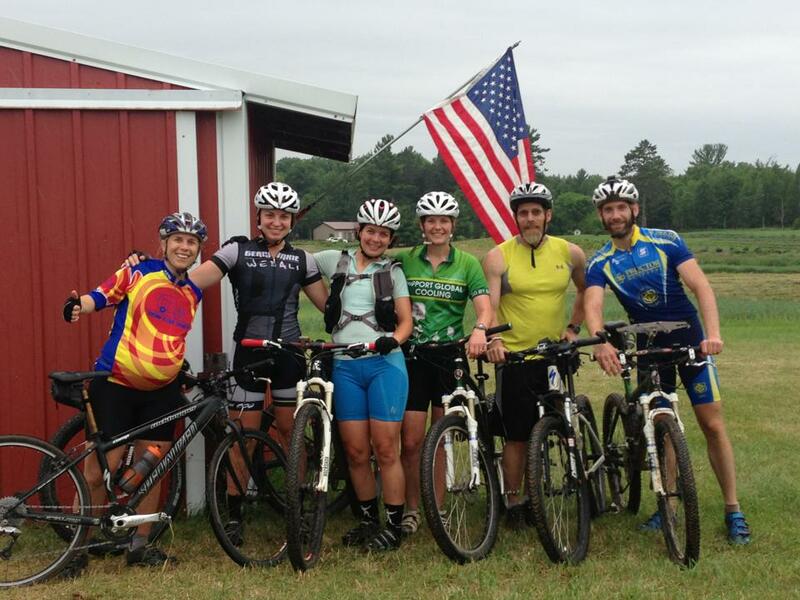 I'm lucky that there is a shortage of girls in adventure racing and a lot of teams like to race coed. I have the time, they need a girl racer...BOOM. I'm in. So when I got an email early in the year from Bushwhacker's Rachel, I was interested in the prospect of racing on a team with another girl. I've done it once before (with Epic Machinery on 12 hours' notice) and had a really great time. We tried to put several races on our schedule, but something or another always came up and spoiled our plans. So when she suggested I join the team for the long road trip to MNOC's 8hr Adventure-O, I was thrilled to finally say yes! 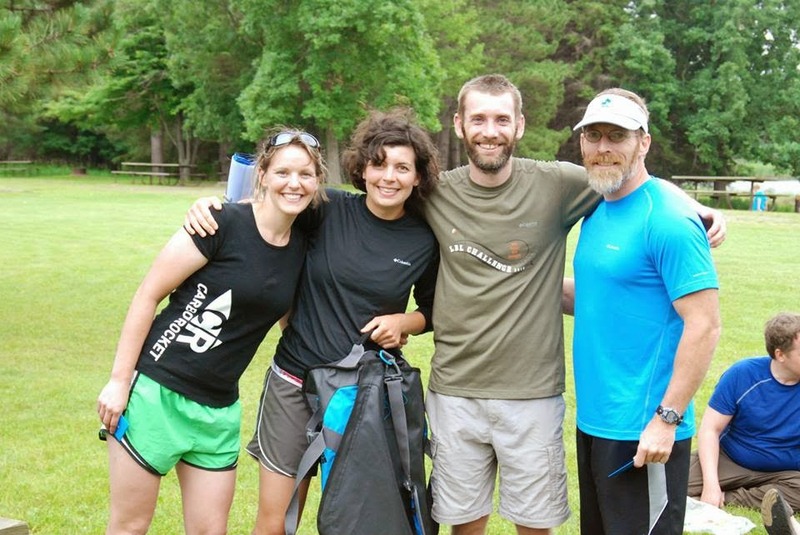 We teamed up with Bushwhacker regulars Fredrik (also Rachel's husband and ace navigator) and Greg to form a 4-person coed team. 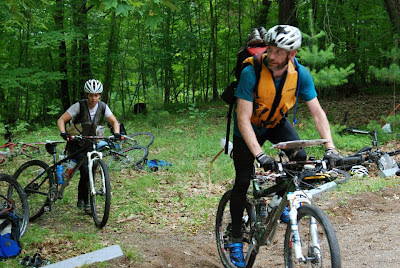 I had done this race last year with gearjunkie.com and was excited to return to another MNOC event. We drove up all day on Friday, but it was a great way to chat as a team and catch up on the Midwest AR scene. Of course stories were being swapped and it was such fun drive. We were graciously being hosted by WEDALI's Molly at the family cabin a few miles north of the race site. Once we got there, it was a full-on Midwest AR reunion with the whole GearJunkie/WEDALI team staying there too (complete with the Silver Bullet!!). Perhaps with other teams this would be weird, but almost all of us have raced together at one point or another, and it's one story after another as we fuel up on delicious pasta and salad. It's wonderful to be surrounded by friends and a great way to start this race weekend. Race morning comes along like so many other race mornings. 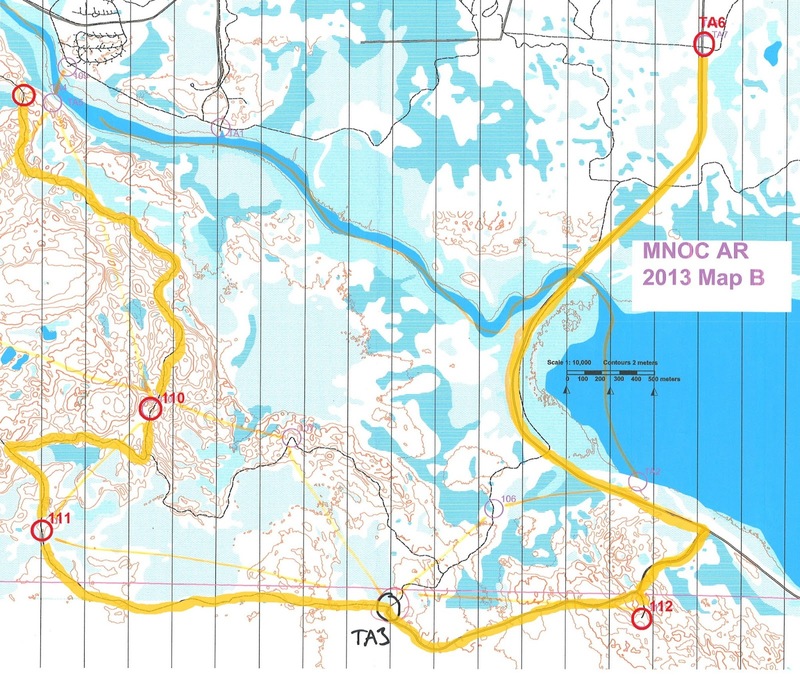 Breaky, coffee, race clothes, frantic gear prep, and pretty soon maps are being handed out. We've decided Fredrik will be on the maps (duh), Rachel will be punching controls, and I will be e-punching TAs. Rachel and I are also both using super-small packs so we can help carry PFDs throughout the race. Bushwhackers just after receiving maps. 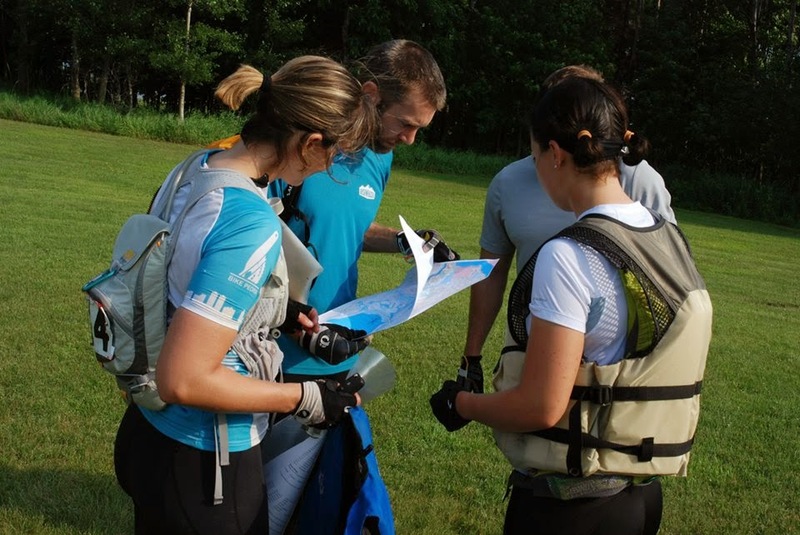 We have about 15 minutes to strategize and route plan before Andrei calls everyone over to the start line. We quickly get our heads around the race and realize we are in for a lot of transitions...9 of them! Pretty soon everyone is at the starting line and Andrei yells GO!! Start at the triangle. 101-105 in order, then to TA1. We take off from the Mille Lacs Kathio Interpretive Center at a brisk but steady run. Our friends from GearJunkie/WEDALI join us and we form a little pack at the front, and the race banter strikes up in full force. I had this feeling last night, that no matter who finishes first today, it is so fun to race with and against these people. 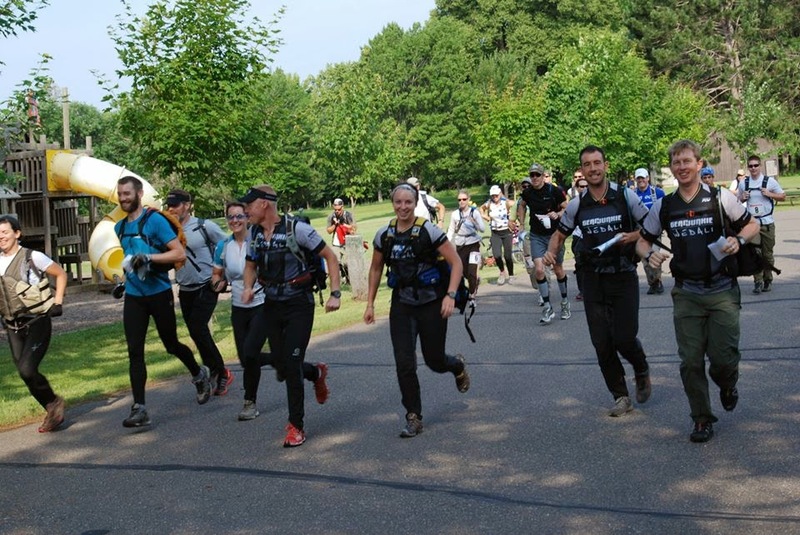 The mood on this opening trek is just that - we are all competing but the most important thing is to be among friends and have an enjoyable day in the woods. Let's do this! Me, Fredrik, Greg, Rachel, Erl, Amy, Tom, Erik. Clearly Erl is already trash-talking. 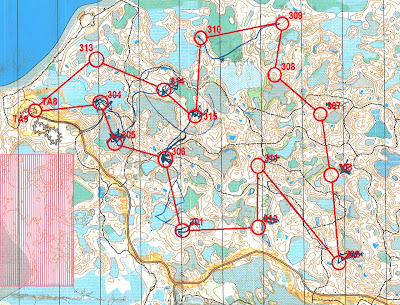 We run loosely with GJ/WEDALI for the first 4 CPs, each taking different micro-routes to the flags. 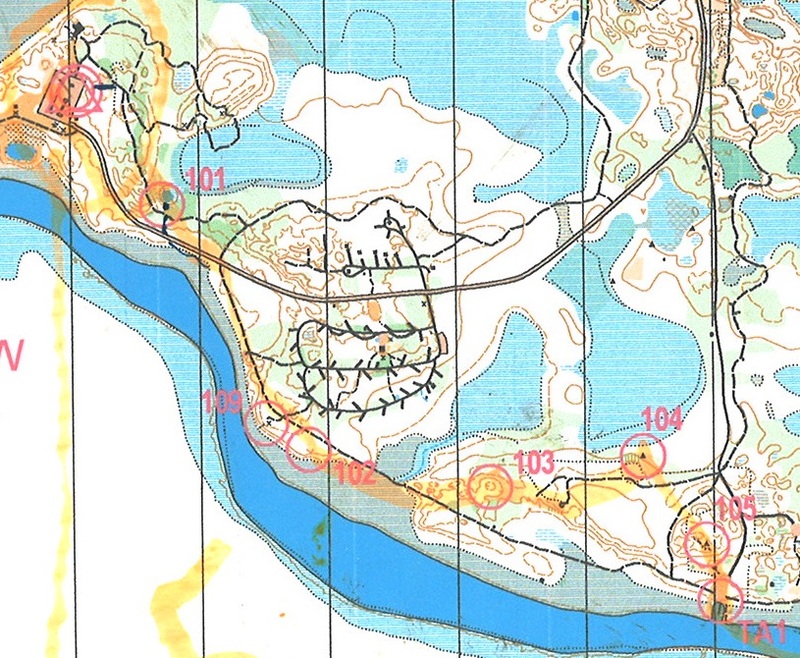 Fredrik has already taken a liking to the 1:15k orienteering maps we get to use today (normally ARs are on 1:24k USGS maps which don't provide as much detail). We're all together until the attack on CP105, where we take a slightly better route and find ourselves alone at the flag. Rachel punches, and we scoot out of the woods into TA1 in first place. We are really disorganized in our transition to the paddle, but that's mostly because we've never raced with each other before. But we finally get our paddles and boats sorted and I hop in the front of Fredrik's canoe as we paddle out onto the Rum River. Yes, we really were that awesome in TA1. Paddle from TA1 to TA2, no intermediate CPs. 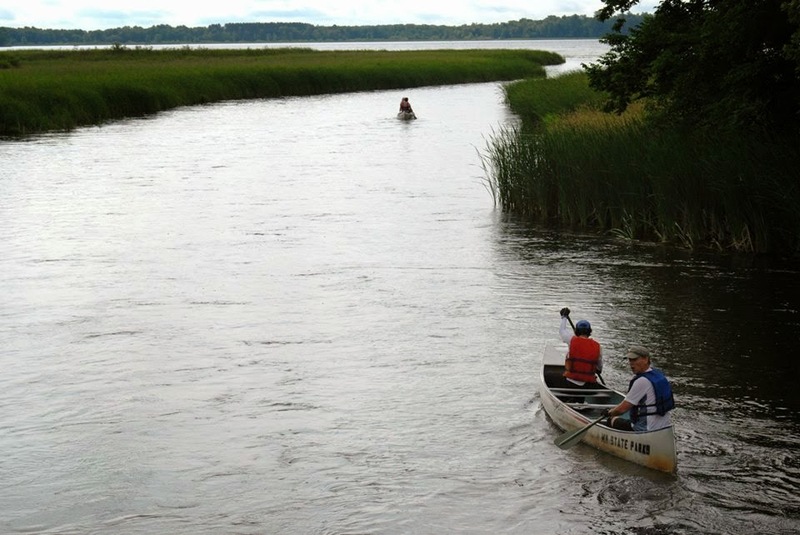 I am so excited about paddling on the Rum River! Yesterday on the drive north, we crossed over this meandering river at least five times and I was enchanted by its reedy banks and clear water. And now we get to see it up close and personal! 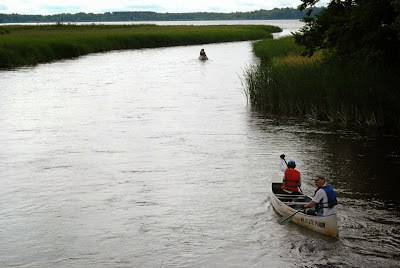 Fredrik and I lead out and after only a few hundred meters, we see a bald eagle fly across the river. It is so cool! The paddle is rather uneventful because we have no intermediate CPs, but it is really beautiful. Towards the end we enter Shakopee Lake and have to negotiate some weeds. 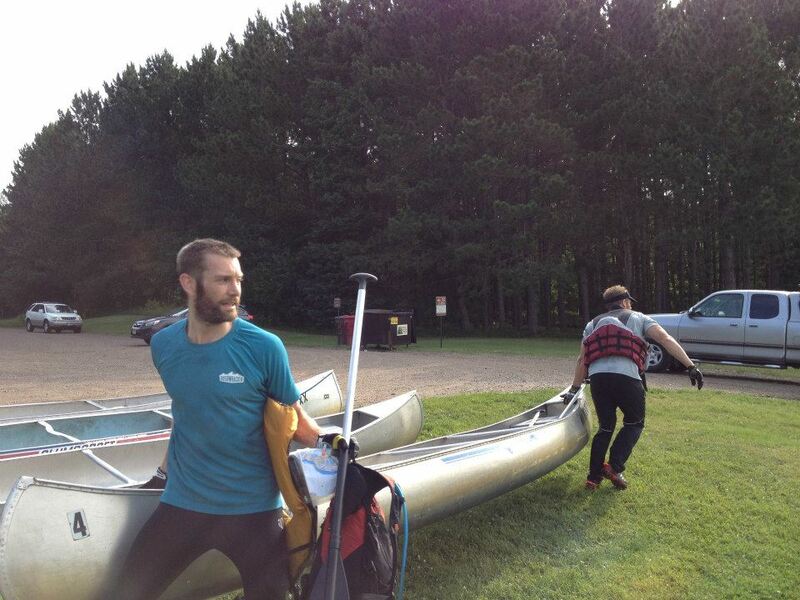 Fortunately, the water is not too shallow so the boat can slide over everything. 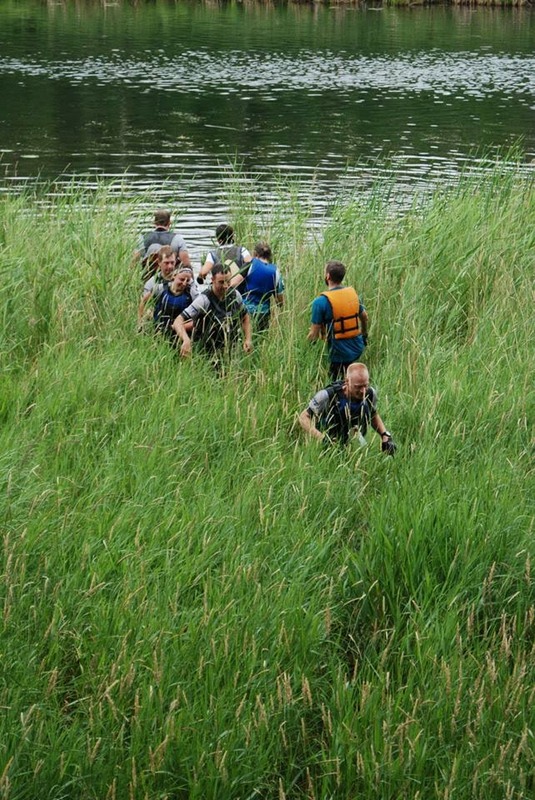 Rachel and Greg are leading the charge towards the take-out and find it hidden among the reeds. We are the first to take out, but GJ/WEDALI along with several other teams are within visual contact so we hustle through the TA. It goes much better than our first one and pretty soon we are running down the road! 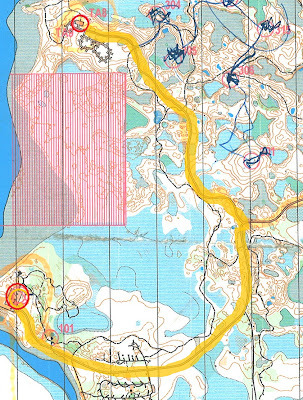 We take a road route and trail route to CP106 and just as we are turning left onto the trail, GJ/WEDALI comes into view behind us so we know they're in hot pursuit. 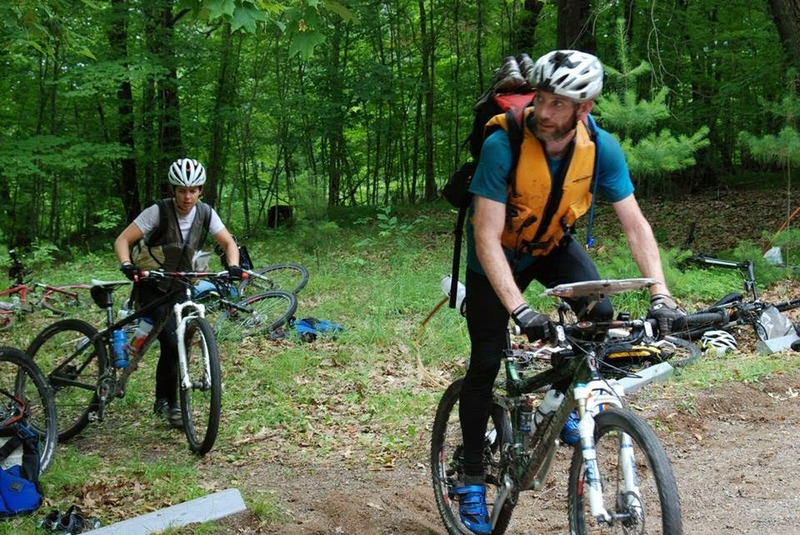 The run to CP106 is fine and we continue our brisk pace into TA3, where we pick up our bikes. We're still in the lead, but the bugs in TA3 are thick so we quickly bike out of there! We ride out of TA3 and on a mission to pick up 2 CPs en route to the next TA. We are on the grassy doubletrack trails of Mille Lacs Kathio State Park. They are not technical but still require attention due to the wet grass, mud patches, and occasional hidden stick. It's here that Greg mentions he's having trouble keeping pace. The heat and humidity have taken a toll already and he's struggling. 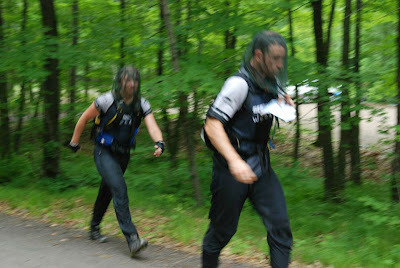 We slow our team speed, I take his pack, Fredrik puts him on tow, and Rachel pushes from behind. This is a team sport and we know that any one of us could go through rough patches throughout the day, and it's the team's job to solve those issues as they come up. I think we've got a pretty good system and we are able to make great progress down the trail. GJ/WEDALI catches and passes us but we're not bothered. We are more focused on keeping our team in good spirits. And besides, we know that the race will probably be decided on the final trek, so our goal is to reach that part of the race with Greg's legs in the best shape possible. 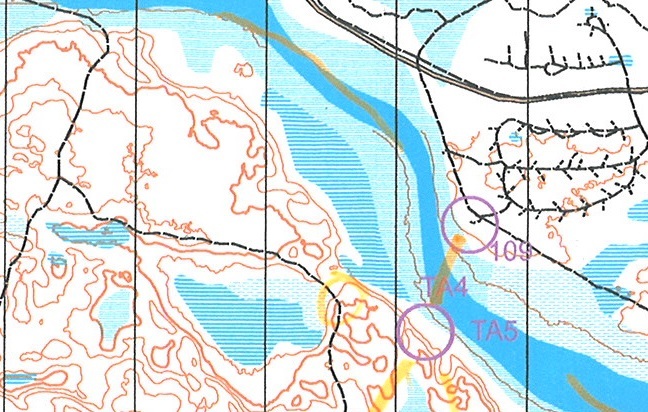 The instructions for TA4 are to leave our bikes trailside and run down to the river's edge for the punch. When we arrive at the designated bike drop point, GJ/WEDALI are still there and we are able to pass them in transition. We run to the water together and I punch in to TA4 as we are preparing for the swim. We leave our shoes, helmets, and packs on the bank, just taking our PFDs and the passport into the water with us. Now we get to swim in the amazing Rum River! 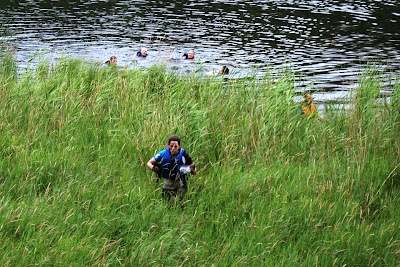 If you've read any of my other race reports, you'll know that I LOVE SWIMMING in adventure races. 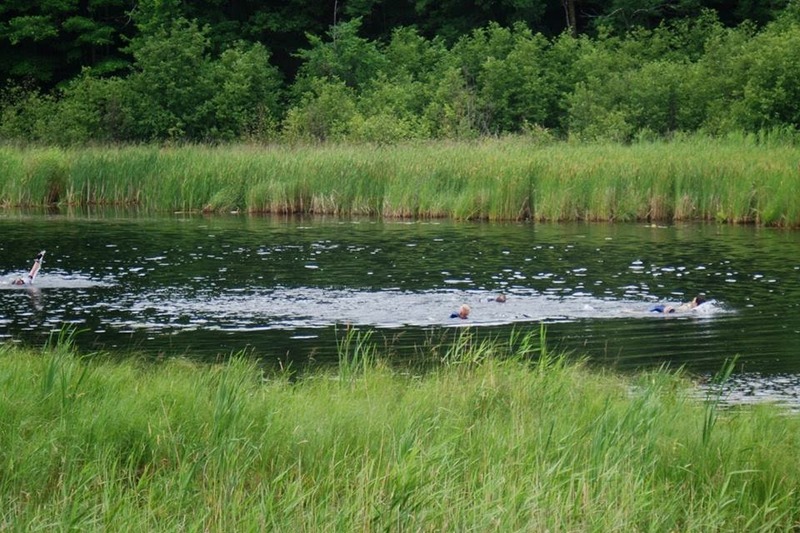 The water is cool as we wade through the reeds and out into the main channel. 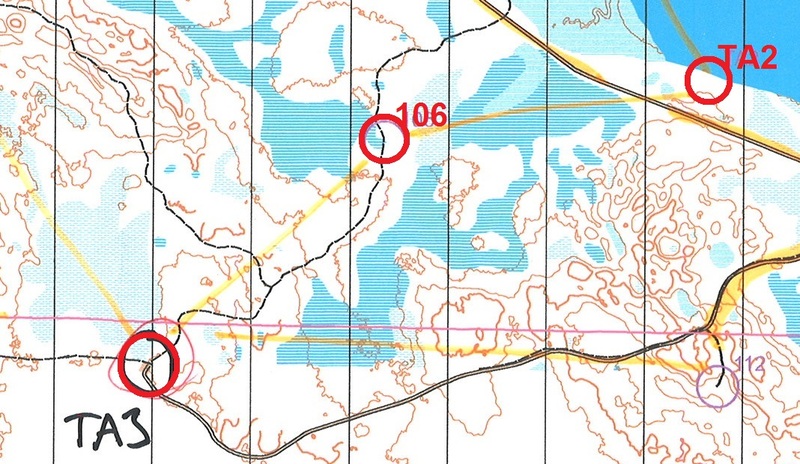 Drop bikes on the trail, run to TA4, swim to 109, punch, swim back to TA5, run back to bikes. The race instructions mandate that we swim along the river, not directly across it so we get out into the main channel and start stroking. 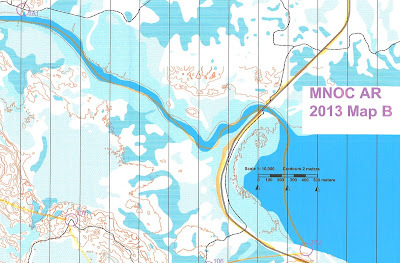 This swim is coming at a perfect time for our team - the cool water will help Greg recover from the heat/humidity, plus we're back in sight of GJ/WEDALI so we get a good morale boost. There's not much you can do to tow on a swim, but we are all good swimmers anyway so it's not an issue. We just casually swim along the river, trading jokes with GJ/WEDALI and having a good time. It really feels like a float trip instead of a race. 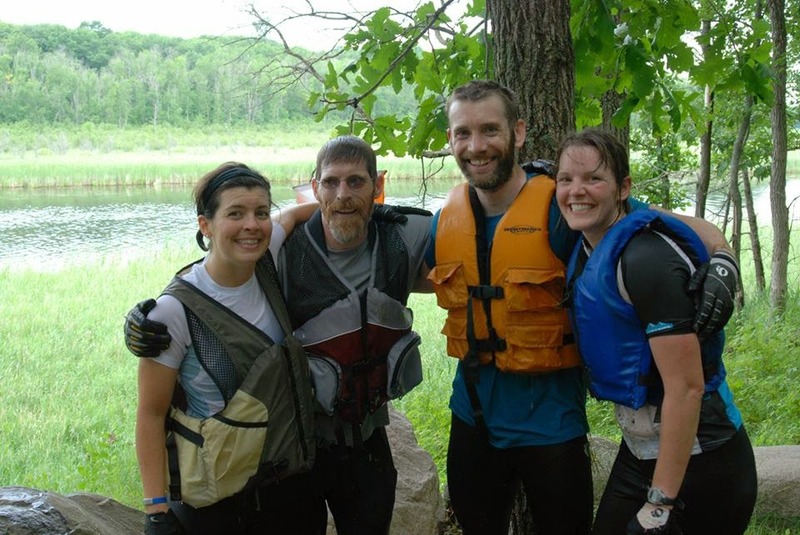 Once we get close to the opposite bank, Rachel runs up with the passport to punch and we all follow since there's a required team photo. I didn't know about this during the race (since I was taking my sweet time climbing up the riverbank), but the punch was located about 10 feet in the air so Fredrik and Rachel had to do some gymnastics to get up that high. After they punch, Greg and I arrive to take the photo and then it's back down into the water for the return swim. GJ/WEDALI has fallen back a bit so they're just coming out of the river as we're going back in. There is one obvious path through the reeds, and Erl is wading through it as we approach. 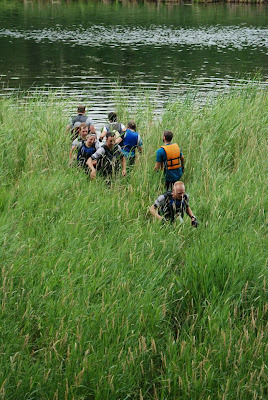 Normally, I would find another path through the reeds, but since the race atmosphere has been so fun so far, I decide to head straight towards him to shake things up a little bit. Erl catches my line and we square off for a friendly round of water-wrestling. And then I'm not sure exactly what happens but as soon as we make contact, Erl falls completely backwards into the river. I'm still standing there, a little stunned. I really did not mean to knock him completely over. But the look on Erl's face is just as stunned and it's immediately hilarious. We all start laughing and it just adds to the awesomeness of the day. Thanks for being such a great sport, Erl!! After the "fight". Top 10 race memory right there. The return swim seems way shorter and we complete it easily. Everyone is in good spirits as we put our shoes, helmets, and packs back on and climb the little hill back to the bikes. 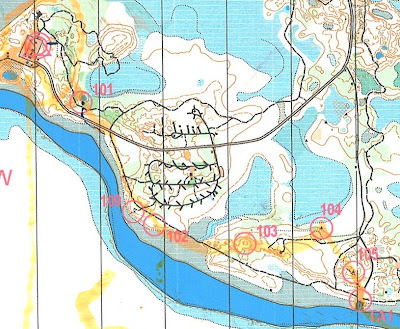 About midway up the hill, I'm reading the clue sheet for our next leg and realize I've forgotten to punch TA5. CRAP! So I run back to the river where GJ/WEDALI is just getting out and Erl gives me a load of trouble for forgetting the punch. I completely agree with him, remind him that I just totally devastated him in the water, punch, and run back to my team. We leave TA5 in first and immediately resume our team-forward-motion strategy. 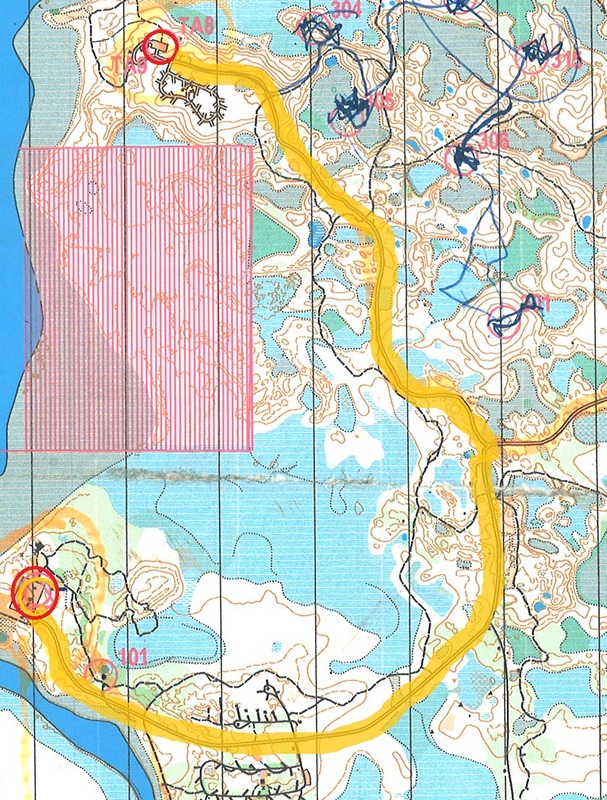 The trails are the same grassy doubletrack and Fredrik continues to navigate cleanly. 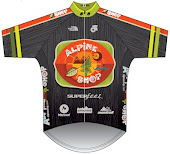 One hallmark of this terrain is short, steep downhills followed by short, steep uphills. Greg wisely decides not to use the tow on the downhills. 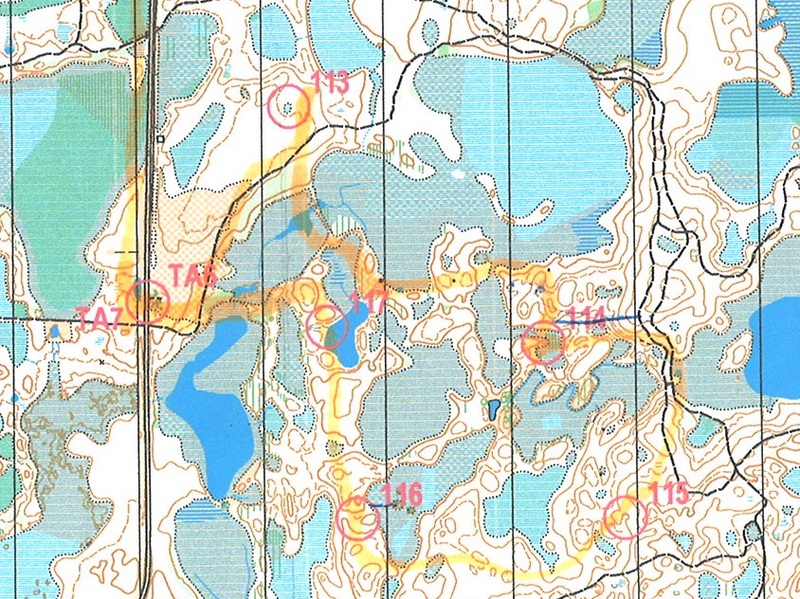 It's a good choice, because as I'm descending one of the downhills, I see Fredrik on the ground at the bottom. And he's covered in mud. At the bottom of this little reentrant there was a wet spot which Fredrik tried to ride, and it ended up being way deeper than he thought. I didn't see the crash but Rachel reports that it was a complete endo. Fortunately, the wet spot provides a soft landing and Fredrik grins through the mud covering his face and jersey. We all bust out laughing again and it's just one more great moment in this increasingly awesome race. Using all of our available team resources (towing, switching packs, and pushing), we manage to stay ahead of GJ/WEDALI until CP112. There, we overshoot the flag a tiny bit and as we turn around the punch, they are breathing down our necks. Since they are strong bikers, I'm really happy that we've held them off this long! Once we are on the pavement to TA6, the blow past us and Erl tries to tell me a story about forgetting his helmet back at TA5. So that's probably why they took so long to catch up. We're not worried; we've been doing a good job of keeping everyone hydrated and fed and protected in a paceline. 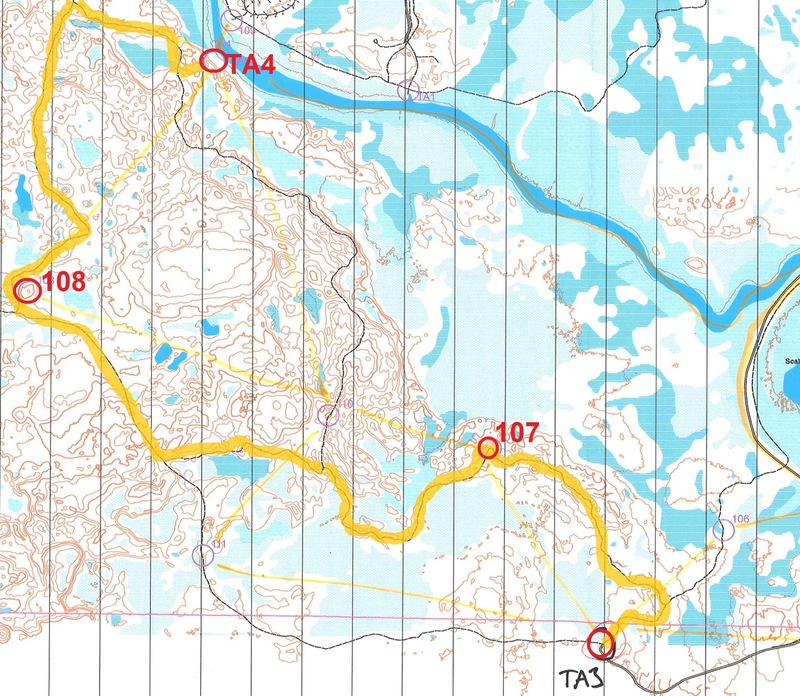 We roll into TA6 just a few seconds behind GJ/WEDALI and transition into trekking gear. 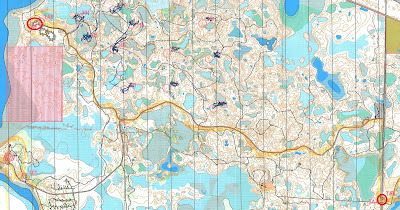 Even though this is our third trekking leg, it's really our first exposure to the more difficult navigation challenges offered on this map. 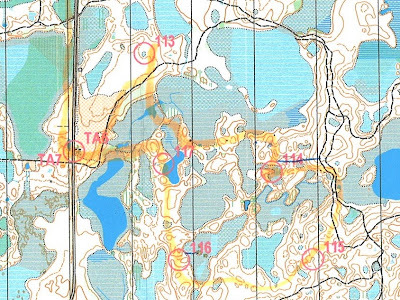 Tom (navigating for GJ/WEDALI) and Fredrik (navigating for Bushwhacker, obviously) are both very talented so it will come down to who makes the least mistakes, and whose team can move steadily through the woods. We punch 113 mostly together, and then both teams opt for the trail around-route to 114 (instead of the marshy route highlighted on the map). Even with the trail route, we still have to cross some marsh, and it's awesome. I don't have much experience with marshes but this one is great. There's some open water to cross on the edges, and then a boggy mat of plant matter that feels like walking on a huge water bed. So fun!! I don't even care that I'm soaking wet from the waist down. Somewhere around the vicinity of 115 (can't remember exactly if it's before or after), we're running next to GJ/WEDALI when Rachel starts asking Greg if his bike tow can be adapted into a running tow for the final trek (she's always thinking ahead). We discuss this option, bemoaning the fact that we didn't bring a running tow, when Erl pipes up that he has one in his pack and he will give it to us (I think his direct instructions were "as long as you don't use it to your advantage"....ha!). We eagerly accept his offer and use the running tow to help Greg move through the woods more easily. We're not really running very much, but Fredrik has a killer speed-hike and he's making all of his nav decisions while still moving, so we hardly have any stationary rest breaks as a team. That is very much appreciated because the bugs have woken up and are now attacking us with fervor. Deer flies and mosquitoes are the most aggressive and persistent. I can't really believe how many bugs I'm wiping out of my hair every 10 seconds. It's really bad, and incredibly distracting. 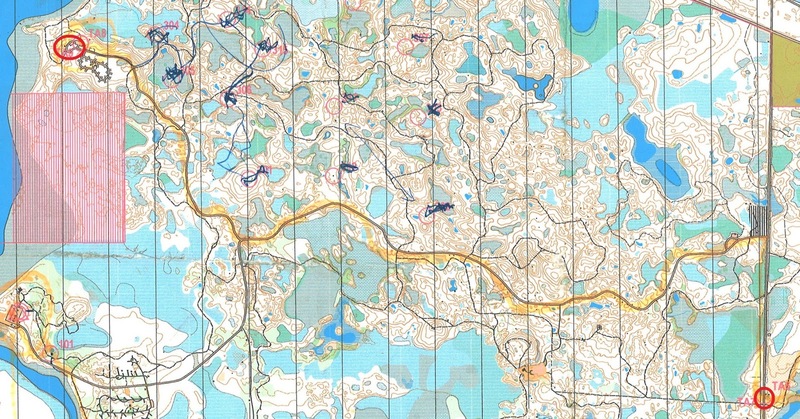 I can't even imagine how Fredrik is keeping is focus on the maps. But he is, and we're nailing just about everything, and the only way to escape the bugs is to keep moving forward. We are still with GJ/WEDALI as we finish up the trek, but we have a lightning-fast transition (aided by a friendly push from Tom when my bike was stuck in a super hard gear) and get out on the road in the lead. We immediately organize into a paceline and focus on keeping everyone together. There are only 3 more legs left of this race, and GJ/WEDALI will be on our tails before we know it. Fredrik does a great job continuing to tow Greg, and Rachel and I work together sharing pulls at the front. Before we know it, we're screaming into TA8, having emptied all of our bike nutrition and ready to begin the final, deciding trek. As we're changing into trekking shoes, there's still no sign of GJ/WEDALI so we're motivated to make it into the woods first. The final trek. We could go in any order. 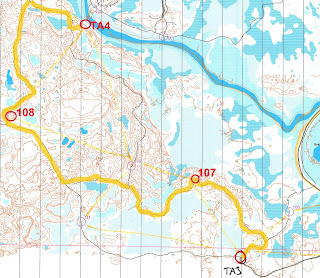 This was our route, starting with 304 and moving counter-clockwise. We decide to keep Rachel punching on this leg and I will tow Greg. My legs are honestly feeling great and I'm excited to contribute. I recently re-focused on run training and after only a few weeks, I'm feeling a big jump in fitness. It's a good thing too, because the bugs have seemingly re-doubled their efforts from the first trek. The deer flies are attacking my head, neck, and shoulders and I'm continually pulling handfuls of them out of my hair. It's very uncomfortable. At times I hyperventilate a little from the stress. But part of my mind thinks it's pretty hilarious, and there's nothing to be done except keep moving. So we do, and Fredrik is absolutely crushing the nav so we don't have to stop or double-back or anything. We just keep clicking each CP off one by one. GJ/WEDALI heading out of TA8 with the coveted bug nets. Around the half-way point, we keep our eyes open for GJ/WEDALI. We have no idea which route they took, but if they went the opposite direction, we will probably be seeing them shortly. But we don't, and it's probably a good thing because we probably would have tried to rip the bug netting they used off their heads. The bug situation is absolutely THE WORST I have ever experienced in my entire life. There really are no words. Only swatting and forward movement. At 309, we start our CP countdown. Five to go. Last big marsh crossing. Four to go. Fredrick is rocking the nav, Rachel is punching aggressively, and Greg and I have developed a really great rhythm through the woods. Three to go. Two to go. Short leg, we nail it. One to go. PUNCH!! Now about 500m of trail running and we're in. We spot a clearing in the woods. Then cars. Then our bikes. Then volunteers (who, by the way, have been amazing all day). We punch TA9 and they tell us we're first out of the woods!! Fantastic! We joyously transition back onto bikes for a short, paved ride back to the finish. Heading out for the finish line! The road ride back is easy and quick. We still keep the tempo up just in case, but we don't kill ourselves. We're all congratulating each other on a hard-fought team victory. There were times when we could have gotten negative and slow, but instead we kept each other happy which means fast. Even though I've never raced with Rachel, Fredrik, or Greg before, there is a common language that AR teams use and we all spoke it fluently. I think my favorite example of that is during one of the biking legs, I think it was Bike 3. I was using a tiny CamelBak pack all day, and Fredrik was carrying my trekking shoes in his larger pack. I had a moment of panic when I asked if he had put them in the pack after TA7 (I had flung them in his general direction at TA but didn't actually put them inside the pack myself). He wasn't sure. But Rachel was right there and said that she had put them in there for both of us. To me, that exemplifies our teamwork throughout the day; we all watched each other's backs and made sure we were all functioning at the highest level of teamwork. Good job, Bushwhackers!! The finish line! We were wet the entire race. We are the first ones back to the Interpretive Center, and my grandparents are there to greet us!! They drove down from Duluth just to say hi and deliver peanut butter bars. Love them! We turn in our passports and I download the e-punch to get our splits. The computer says I missed TA4, but I convince Molly that I was there and that GJ/WEDALI can vouch for it. She understands my mistake and we get our splits printed out. 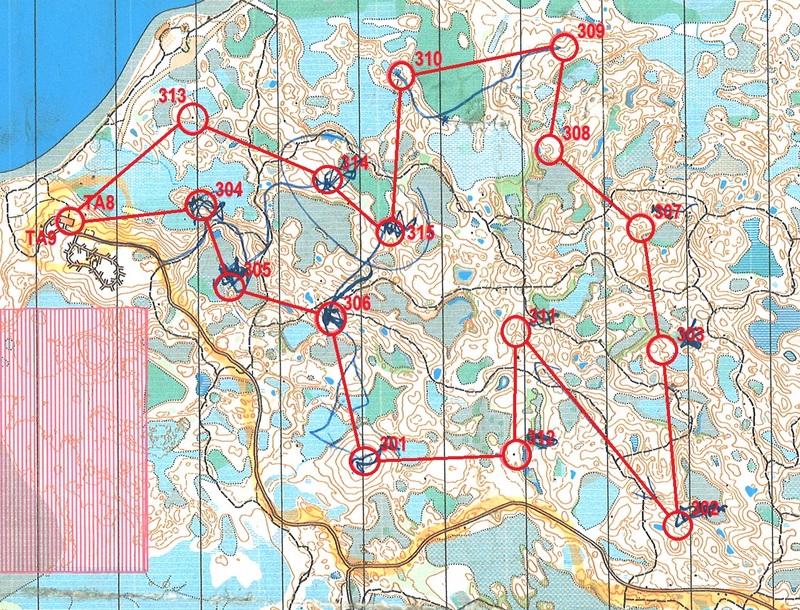 Using the orienteering e-punch for AR really is great for immediate results. We chill out a little bit until GJ/WEDALI comes rolling through and congratulate them on a great race. 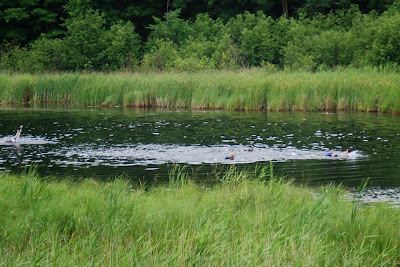 We all decide to swim a little bit in the park's pond, and it's clear that it doesn't really matter who crossed the finish line when; we're glad to have shared a great day in the woods. 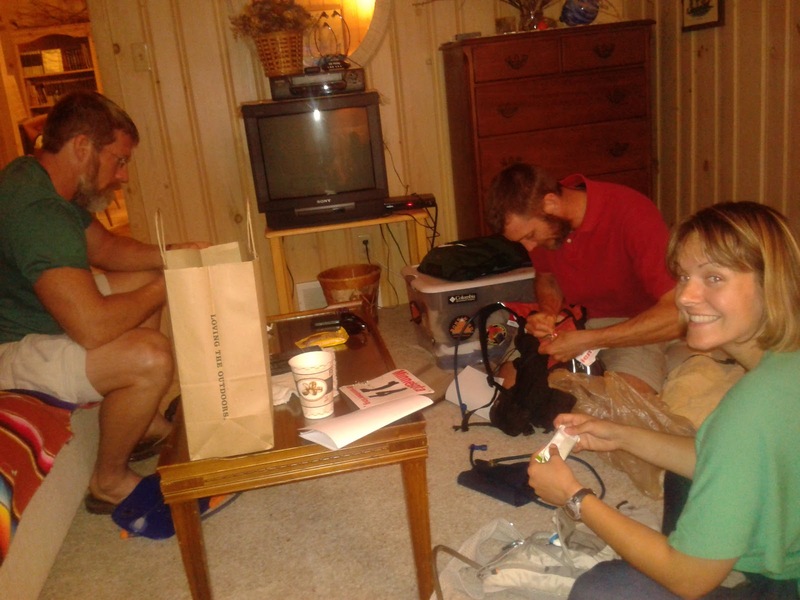 Rachel, me, Fredrik, Greg after picking our prizes! 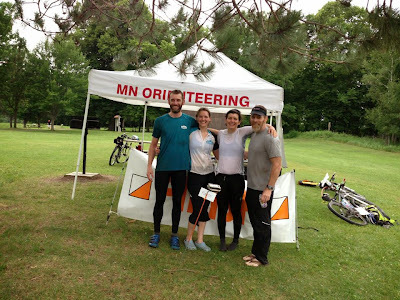 The rest of the afternoon is spent cleaning gear, lounging on the grass, eating lots of watermelon, and just generally catching up with all of wonderful people in the MN adventure racing and orienteering communities. MNOC put together a terrific prize table and we each walk away with something fun. I pick a really sweet Columbia duffel bag to replace the one I've had since high school soccer (and is torn in 2 places). I can't say enough good things about this event. It was incredible racing on the Bushwhacker team with Rachel, Fredrik, and Greg. I've competed against them enough times to know what fierce athletes they are, but to be welcomed as part of the team also shows what awesome people they are too. 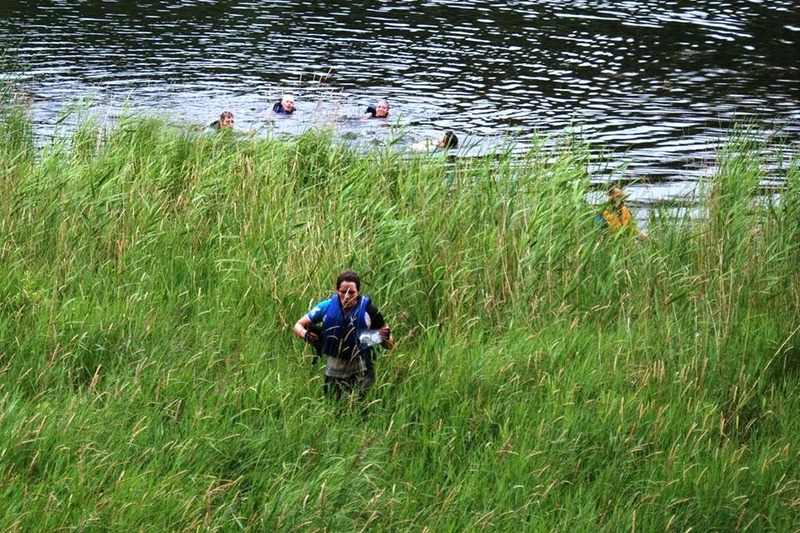 Andrei designed a really fun and interesting course that challenged all of the teams....and we got to go swimming! With Andrei's nav expertise, we didn't have to worry for a second about any mishung controls - everything was accurate and well-mapped to boot. All of the volunteers were informed and encouraging. 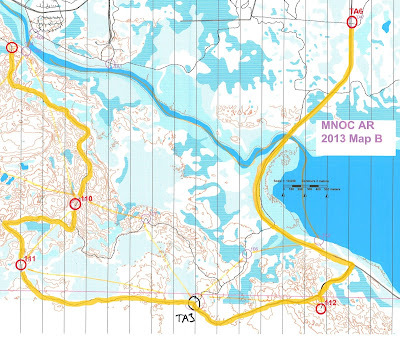 There was tons of support on course and it's clear that MNOC has its act together when it comes to putting on a big event. Mo, Amy, me, Rachel, Greg, Fredrik at the strawberry farm. We were going to go ride bikes at Cuyuna on Sunday but the weather had other plans for us. 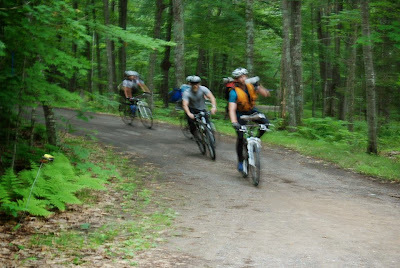 Instead, we helped MNOC do control retrieval on the course and then rode some gravel. I got to nav a little on the area from Trek 4 and it was amazing. The woods are super open and the map was detailed and accurate. Rachel and I ran together which was awesome. And yes, the deer flies and mosquitos were still horrendous. Later on in the day we went strawberry picking, and then relaxed at the cabin before the long drive home on Monday. Thanks especially to Mo who was a wonderful hostess and planner! Congrats on the win! Great race report too (as always). mighty fine bad-assery. need a bug shield on your 2013 Christmas list??? Sounds like that was the hardest part of the day!